http://www.waterstreetglassworks.org/ 925-5555 anna@waterstreetglassworks.org 142 Water Street, Benton Harbor - located in the BH Arts District off of Main St. Catalog option: If a student finds a WSG class in their schedule not listed here, it may be able to be taken through the partnership, covered in part or in full depending on cost. Classes in catalog are not guaranteed to be covered, we will evaluate on a case-by-case basis. Intensive studies may also be available for serious art students in their Junior or Senior year. WSG is also looking for teens to volunteer at various events. Students have to register with WSG as well as the partnership: Call 925-5555 right away after registering. ​Additional registration at location is required. 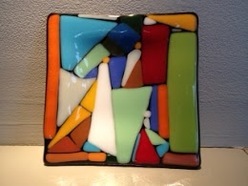 Bring your imagination and sketchbook and learn the fundamentals of kiln-fused glass. Focus will center on learning color theory, design considerations and vocabulary. Physical skills will include safe handling of materials and proper use of tools. This class may be repeated; skills will be built upon. NO EXPERIENCE REQUIRED. Personal non-family recommendation letter and student interest statement required for new students. Minimum age: 12 Bring a sketchbook. All other materials included. Learn how to make glass beads with rods of colored glass and a tabletop torch. Safely shape and mold the glass into different shapes while learning the fundamental properties of working with molten glass. You’ll make enough beads to turn into a necklace by the end of class. Physical skills will include safe handling of materials, proper use of tools and fine motor skills. This class may be repeated; skills will be built upon. Minimum age: 12 All materials included. Gina has been melting glass and creating beads for over 15 years. She has a relaxed teaching style and encourages creativity and experimentation in her students. She currently teaches beadmaking classes at Water Street Glassworks as well as in her own studio. Gina works with soda lime glass (soft glass) as well as borosilicate glass and teaches classes on the hot head and Minor torches. Gina creates jewelry from her glass beads, lending a practical aspect to the glasswork done on the torch. 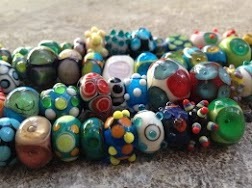 Week 1--Lesson will include overview and discussion of the glass beadmaking process. o Learn about different types of glass and C.O.E. Week 2--Following a brief review of safety procedures and torch lighting, Instructor will demonstrate pulling stringer and the process of laying a good foundation of glass on the mandrel to achieve a well shaped base bead. The dot embellishment will demonstrated. Students will work on the torches to practice their skills. Week 3--Brief review followed by demonstration by instructor. Using the dot embellishment in a variety of ways to achieve a variety of different looks, including the Harlequin style bead as well as stacked, layered, poked, twisted, etc. Students will practice this skill on the torches. Week 4--Brief review followed by demonstration by instructor. Students will learn how to decorate their beads with stringers, including wrapping the bead, and making swirls. Week 5--Brief review followed by demonstration by instructor. Students will learn to shape their beads in a variety of ways, including pressing and shaping with various tools. Students will practice this skill on the torches. Week 6--Students will build on the skills from previous classes. Week 7--Students will work on the torches and demonstrate to the instructor that they can make a well-shaped base bead. The last part of class will be spent completing a necklace with some or all of the beads created during the course of this class. This four-week class is designed to introduce the novice to the medium of glass as a material for creating art and crafts. Students will learn how to use the methods and processes of glassblowing to safely shape molten glass into vessels and sculptural artworks. The class will begin learning with exercises and move into making paperweights, cups and flowers. This class will serve as a prerequisite for further classes in glassblowing. NO EXPERIENCE REQUIRED. *Personal non-family recommendation letter and student interest statement required. Week 1​--Safety exercises, lecture on glass properties, tool use, teamwork and gathering exercises. Projects teaching tool use are: the paperweight and ‘caterpillar ‘exercise. Week 2​--Steps in making a clear drinking glass, and practicing the teamwork necessary to help make a glass and transfer (‘punty up’) the glass. Learning how to use the lapidary grinder to flatten a base of a glass or paperweight and a sandblaster for added surface design. Week 3​--Surface techniques on clear glass: bubbles, crackle. Week 4​--Use optical molds for making ribs on a blown piece.